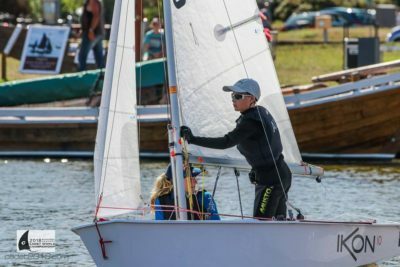 Sand Bay Sailing Club’s Archer Ibbott and James Gough have become the second Australian crew to win a race at the International Cadet World Championships at Bodstedt, Germany. Ibbott (15) and Gough (12) won race eight, the last race on day three of the championship to lift them to seventh overall in the 63 boat fleet from 13 nations. Their win followed a 22nd place and an eighth. Over the three days of racing they have improved their overall position in the fleet from 22nd at the end of day one, when they accepted a place penalty following a port-and-starboard incident, to seventh, yesterday finishing 22-8-1. Top ranked Australians are Peter Allen and Ashton Rowstron from the Royal Yacht Club of Victoria who are fifth overall, maintaining their consistent sailing with 16-9-7 yesterday, the 16th their worst result so far and first discard. Four Australian crews remain in the top 20 of the 63-boat fleet with today a lay day after eight races. Hugo Allison, youngest Australian skipper at the worlds. Tasmanian crew Jacob McConaghy and Sam Hooper are 15th overall (the other Australian team crew to win a race at the Worlds so far) while Hugo Allison and Grace Hooper at 17th. Hugo and Grace are also top of the leader board for the mixed crew trophy with Elliott Hughes and Cate McCoy in second place. The Geelong pair are 23rd overall. In his post day three blog, coach Tony Bull said today was a well-earned lay for our team with most spending the day sightseeing and taking it easy. “The racing yesterday was a mixed bag, the first race was a really poor one for Oz. A 30 degree windshift saw the fleet reaching into the top mark and threw the race into disarray,” Bull reported. Bodstedt. 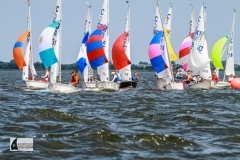 Germany – hosting the Cadet worlds. “Our sailors were on the wrong side for the most part and suffered accordingly. 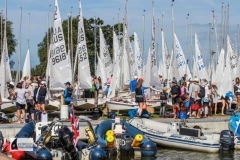 “After that first race our day improved with some single digits and low teen finishes from our boats, but once again coming through from a long way back. “The day finished with a highlight of Archer Ibbott and James Gough winning race eight. Congratulations boys. ‘’As a coach as the regatta unfolds, it is always bitter sweet. Some sailors are doing well and others not so great. “But we do have all our team in top half of the fleet, with Peter Allen and Ash Rawstron in 5th with remarkable consistency. And Arch and James have jumped into 7th. “The Argentinian crew have taken a pretty strong grip with some pressure from the Belgians in 2nd. Also amongst the leaders is a smattering of Pole and Brits, all worthy adversaries.” Bull added.